Within a trio of executive moves in a bid to accelerate key global partnerships and capabilities, the current CEO of Embraer Commercial Aviation and executive vice president of Embraer S.A, John Slattery, has been appointed as president and CEO for the commercial and aviation services joint venture between Boeing and Embraer. The appointment is subject to formal appointment by the joint venture's Board of Directors after closing. Once approved, Slattery will report to B. Marc Allen as the chair of the new company's board of directors. Slattery will be based in Sao Jose dos Campos, Brazil. Slattery joined Embraer in 2011 as senior vice president responsible for customer finance, asset and risk management. He was named president and chief executive officer of Embraer Commercial Aviation and executive vice president of Embraer S.A. in 2016. Prior to Embraer, he spent 15 years in executive roles in commercial aviation advisory, leasing and banking organizations. At the same time, Boeing has announced B. Marc Allen, the current president of Boeing International, as senior vice president of Boeing and president of Embraer Partnership and Group Operations. Reporting to Boeing Chairman, President and CEO Dennis Muilenburg. Meanwhile, Sir Michael Arthur, current president of Boeing Europe and managing director of Boeing U.K. and Ireland, will succeed Allen as president of Boeing International. The change is effective April 22. Embraer is accepting resumes and actively recruiting. View Embraer jobs and career information. Find your next great career opportunity at Embraer. Send your resume today. Avjobs is an aviation job site that focuses exclusively on aviation jobs. The job board allows you to target its audience of aviation job seekers and the interface looks awesome! The viewership is also a plus, you can get unlimited postings for a month or a year for $249 or $799, respectively, and you can get your job listing posted on top aviation sites and top aviation industry blogs through the Aviation Ad Network. February 10, 2017 – AAR Corp is Hiring Now, find available positions on Avjobs.com. 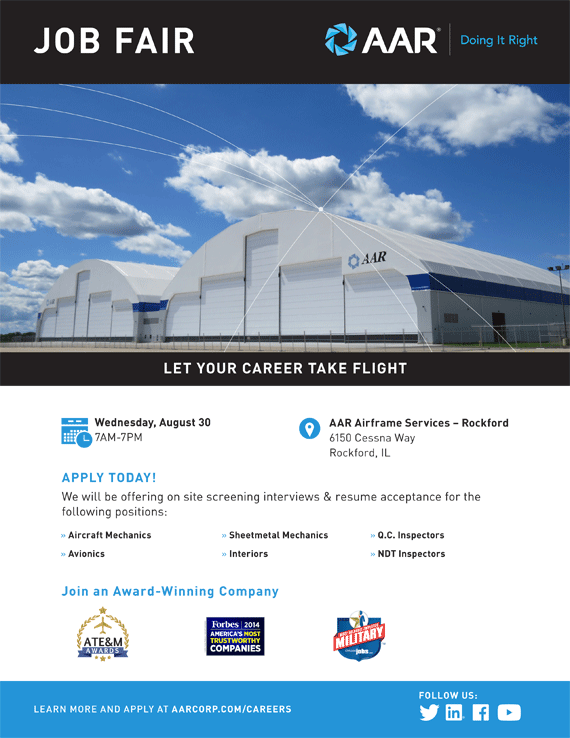 If you are looking for a new career or have ever dreamed of working for AAR Corp, now is the time! You can find over 300 available positions at AAR Corp every day on Avjobs.com. Whether you are looking to work in maintenance, mechanics, inspection, quality assurance, as a technician, engineering, or even an internship, you name your field, and AAR Corp might be ready to hire you today. AAR is a leading provider of diverse products and services to the worldwide commercial aviation and government/defense industries. AAR combines a close-to-the-customer business model with a broad range of capabilities to help customers operate more efficiently lower costs and maintain high levels of quality safety and service. AAR is a financially stable dedicated partner with an enduring commitment to innovation execution continuous improvement and customer value. Avjobs, Inc. is the leading aviation, airline, and airport job site providing e-recruiting application software, applicants to aviation employers, and employment information to applicants. Bringing employers and applicants together while providing career counseling and interview preparation is what makes Avjobs, Inc. the right choice for your employment needs. Where Employers & Employees Come to Meet! 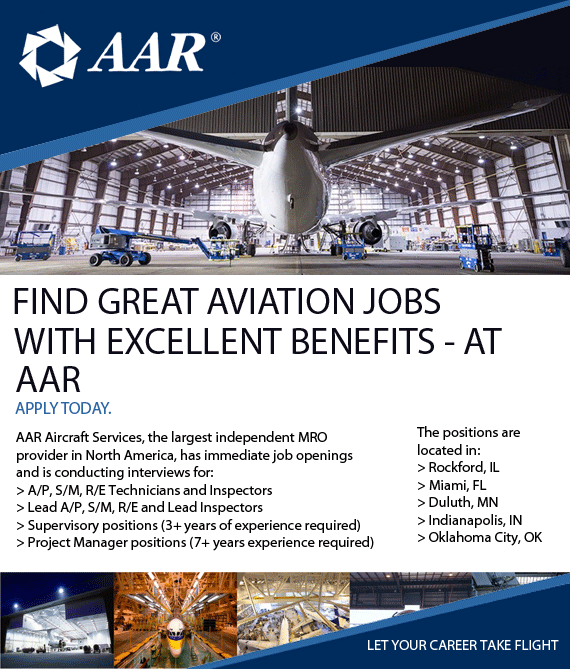 AAR Aircraft Services, the largest independent MRO provider in North America, has immediate job openings and is conducting interviews! Apply Today. Learn more about our Rockford facility: on Youtube. AAR CORP is hiring EVERYWHERE!